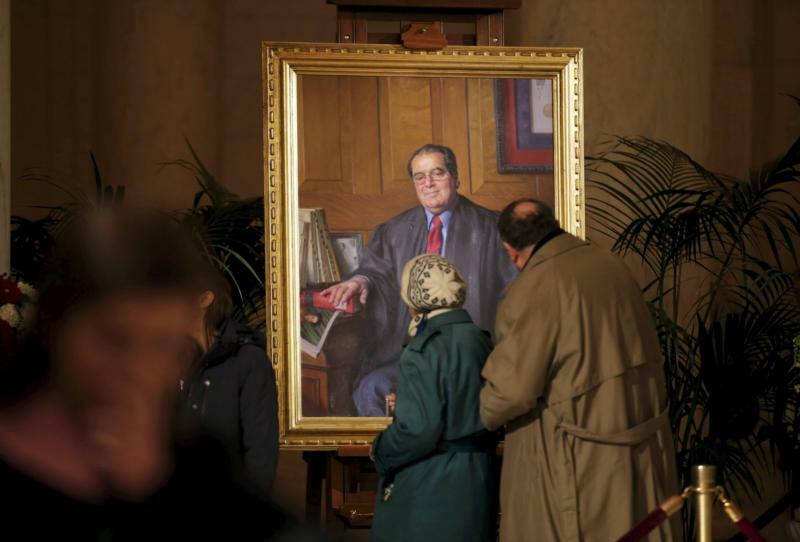 Supreme Court without Justice Scalia: Will it lack a tip of the scales? WASHINGTON (CNS) — As the nation looks ahead to upcoming Supreme Court decisions without Justice Antonin Scalia’s input, it may see a lot of tie scores. That’s because the Feb. 13 death of one of six Catholic members of the court — who was often described as its most conservative voice and known for his strict interpretation of the Constitution’s intent — may lead to many 4-4 decisions. Justice Anthony Kennedy has been described as a swing vote, a term he is said to despise, but depending on his vote in upcoming cases before a successor to Scalia steps in, there will either be split decisions or 5-3 votes with the more liberal justices forming the majority. When the court issues split decisions, the lower court rulings stand and “it will be as if the court did not even take the case,” said Meg Penrose, a law professor at Texas A&M University’s School of Law. “To me, that’s what’s troubling about a 4-4 ruling,” she said, noting that it goes against the court’s decision in the first place to take the case. Penrose told Catholic News Service that equal votes are “all fine and good in a balance, but we have real issues facing the court” that call for clear direction. In particular, she cited the upcoming Little Sisters of the Poor case, which is just one of the oral arguments on the docket this spring the Catholic Church has a vested interested in. The others involve abortion and immigration. The abortion case before the court March 7, Whole Woman’s Health v. Cole, involves abortion clinics in Texas challenging a state law upheld in lower courts requiring them to comply to standards of ambulatory surgical centers and requiring abortion doctors to have admitting privileges at a hospital near an abortion clinic. The law’s opponents say it aims to close abortion clinics and has created an “undue burden” on women who want an abortion, but the state maintains the law is protecting women’s health. The U.S. Conference of Catholic Bishops and other religious groups submitted a joint friend of the court brief in the case supporting the Texas law. Scalia was expected to provide a fifth vote in this case to uphold the requirements. A 4-4 vote will leave in place the 5th U.S. Circuit Court of Appeals ruling upholding the provisions but it will not set a national precedent. On March 23, the court will hear oral arguments in the religious liberty case Zubik v. Burwell, which involves the Little Sisters of the Poor and other religious employers contesting the contraceptive mandate of the Affordable Care Act. The case, supported in a friend of the court brief by the USCCB and other faith groups, will determine whether the Little Sisters of the Poor and other ministries can be forced to provide contraceptives as mandated by the U.S. Department of Health and Human Services. An “accommodation” for organizations morally opposed to the contraceptive coverage was created by the Obama administration to allow those religious employers opposed to the mandate to direct a third-party administrator to provide the contested coverage to their employees at no cost. The sisters and other organizations said their religious rights are still infringed because the alternative steps involve them in seeing that contraceptives objectionable to them are provided. In 2014, a 5-4 Supreme Court ruling in a related case, Burwell v. Hobby Lobby, said private companies did not need to comply with the contraceptive mandate because they were protected under the Religious Freedom Restoration Act. The 1993 law says the government “shall not substantially burden a person’s exercise of religion” unless that burden is the least restrictive means to further a compelling governmental interest. Since Scalia sided with the family businesses in that decision, some feel the upcoming religious liberty case will likely end with a 4-4 vote, which will uphold the lower court’s decision and mean the contraceptive mandate for religious groups will be interpreted differently in different areas of the country. Mark Rienzi, senior counsel of the Becket Fund for Religious Liberty, which is representing the Little Sisters of the Poor, is confident the case will win even without Scalia. In an interview with CNS, he emphasized that the 5-4 Hobby Lobby decision came in a case that involved a for-profit business, not a religious order. He also pointed out that anyone who works for the Little Sisters can obtain contraceptives through the exchanges in the Affordable Care Act. A completely different case with church attention involves immigration. In United States v. Texas, which is on the docket in April, the court will consider whether the Obama administration was entitled to shield more than 4 million undocumented immigrants from deportation, a move that was put on hold Nov. 9 by the 5th U.S. Circuit Court of Appeals in New Orleans, upholding a Texas-based federal judge’s injunction against Obama’s actions. Without Scalia, a 4-to-4 tie is expected in this case, which would create no new law and affirm the lower court’s decision. Charles Wheeler, director of training and legal support for Catholic Legal Immigration Network in Oakland, California, told CNS that Scalia’s death “may have made it harder to get to that magic number” that would have blocked the president’s actions. “I’m guardedly optimistic,” he said, saying he hopes the Supreme Court “looks to precedent and the bigger picture” to stop the deportation plan from proceeding. In 2015, Barack Obama’s executive actions expanded a 2012 program known as Deferred Action for Childhood Arrivals, or DACA, and created the Deferred Action for Parents of Americans and Lawful Permanent Residents, known as DAPA. The USCCB supported this plan and CLINIC, an umbrella organization for Catholic legal services providers, was among 224 organizations that filed a joint brief urging the Supreme Court to take the current case. Law experts have pointed out that another option the court could take with only eight justices is to hold cases over for re-argument when it has a full court in place.